The Albert Park and South Melbourne Rowing Clubs were both established on Albert Park Lake in the 1870s and were amalgamated in 1996 as Albert Park-South Melbourne Rowing Club (APSMRC) as part of the Albert Park Lake redevelopment. We are an incorporated not-for-profit community group with an elected committee and our membership includes active rowers (juniors, masters, and life members) and social members. Our activities include social rowing, competitive rowing, social fundraisers, working bees, boat christenings, and annual general meetings and Christmas parties. We also host the Albert Park Lake Masters Regatta in April each year together with the Y Rowing Club and the Melbourne Argonauts Queer Rowing Club, attracting rowers from around Victoria and interstate. We are affiliated with Rowing Victoria. 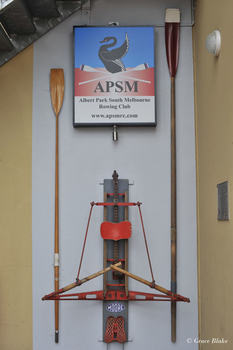 The two original clubs shared a close history with the formation of Albert Park Lake itself, and APSMRC has inherited the two clubs' collections. The club has produced numerous state and national champions (including Olympic representatives and an Empire Games winner), coaches, umpires up the international level and board and staff members of the Victorian Rowing Association/Rowing Victoria. We possess materials pertaining to all these events. 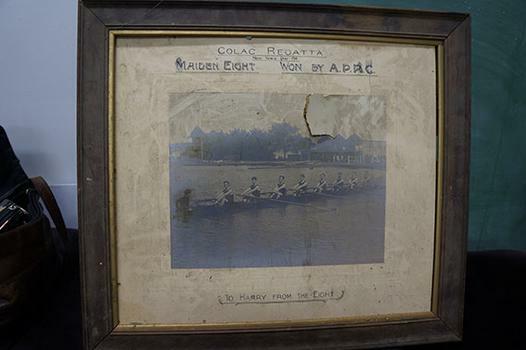 The Albert Park-South Melbourne Rowing Club collection is a collection of photographs, documents and memorabilia which details the process of amalgamation between the Albert Park and South Melbourne Rowing Clubs in conjunction with the formation and evolution of the Albert Park Lake. This collection, which dates from 1873, portrays a pattern of life over multiple generations for the local residents in the City of Port Phillip and beyond which highlights the modern-day Australian ideals of social cohesion, volunteerism, sporting prowess and mateship. The APSMRC collection includes documents, photographs, trophies, newspaper clippings, honour boards, flags, and other memorabilia. "The AP-SMRC collection is significant because it represents its members’ contributions to the national history of rowing and some exceptional athletes, coaches and rowing officials. In another way, the collection is significant because of its survival against the odds: the APRC club-house was accidentally destroyed on two occasions, and the SMRC clubhouse was rebuilt in the 1960s. Relocating the heritage material into the new (1996) Plant Williamson Rowing Pavilion without any systematic form of collection management represents a significant achievement by voluntary office-bearers for whom heritage is not ‘core business’. Finally, the collection is significant because it provides evidence of the continuity of rowing both as a sport and also as a community club activity at Albert Park Lake, a much-loved focal point for Melbourne’s recreational activity in a range of activities for almost 150 years" (Albert Park-South Melbourne Rowing Club Significance Assessment, p3). 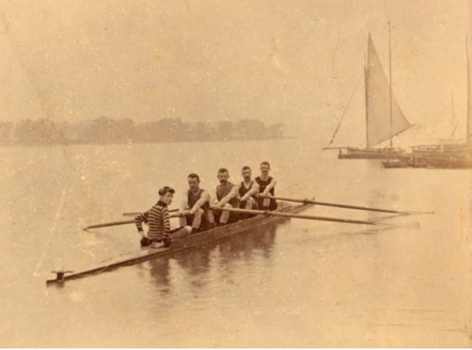 A black and white staged portrait of the members of the Albert Park Champion Four of 1899-1900 in a boat. The photograph is on a grey cardboard mounting. Has a companion photograph - the Albert Park Champion Eight 1899-1900. Similar items in the Stamper Collection, including another copy of this print. J. Counihan (cox), J. Donald (st.), A. Chamley (7), C. Donald (6), A. Hesford (5), C .McDonnell (4), J. Cockbill (3), C. Stamper (2), C. Powell (bow). / Albert Park Champion Eight, 1899-1900. / With A. A. Bishop's Compliments. A black and white photograph depicting five rows of men, standing and seated in uniforms and suits. The photograph is under glass with a brown wooden frame. 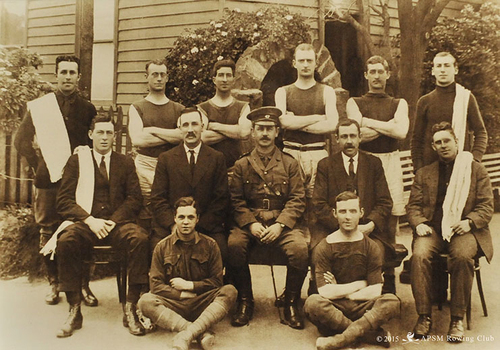 This photograph was taken after the first members of the South Melbourne Rowing Club enlisted in World War One. It was originally published in 'Punch' on 3 December, 1914 on page 19. The names of the men are as follows: Top Row.—Messrs. E. Staff, W. McCabe, C. Wolff, N. Jackson, W. Giles, V. Whelan, G. Tully (Hon. Treasurer), S. Thompson, H. Jones, T. Moves, J. Sherman. Second Row.—Messrs. G. A. Firman, C. Clarke, C. C. King, D. A. Bowman, A. Payne, W. Theil, V. Harcourt, B. Tribe, G. McKay, L. F. Bligh, W. Curtis, B. Haines. Third Row.—Messrs. F. Tobitt, J. J. Scanlan, P. Lohan, A. Jamieson, F. J. G. Maher, J. Bernet, H. Tribe, R. Cazaly, A. Henry, J. Meens, F. Mardell, T. Barrell, C. Bond, A. Casey. Sitting.—Messrs. C. De Fraga, A. Crook (Asst. Hon. Secretary), C. Borrman, R. C. Curwen, P. C. Shaw, W. McKay (Vice-President), A. H. Warland (President), G. T. Hastie (Vice-President), G. Anderson (Captain), H. C. Kennett, Fred L. Loud (Hon. Secretary), H. Dixon, G. Barrell (Vice-Captain). Front.—Coxswains D. Fereday, N. Tobitt, J. Maddock, N. Campbell, D. Donaldson. On reverse: N. Giles top row, 4th from left. 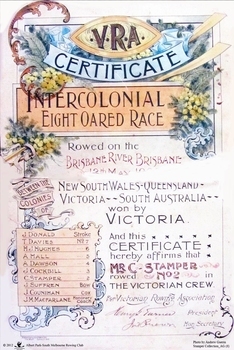 A colour certificate given to the winners of the 1900 Intercolonial Eight-Oared Race. "Grace Blake’s conversations with older members of the Club have elicited the following information during July 2014: • Don Christie recalls the machine being acquired by (or donated to) SMRC in the 1960s. SMRC later donated it to APRC. • Bob Duncan remembers it being at APRC. • Max Shaw joined the club in 1946 but doesn’t recall it at all. • Peter Watson recalls collecting the rowing machine from the old APRC club house before its demolition (c. 1995). The AP-SMRC machine carries a ‘maker’s plate’ with the name Moore... Moore Crane and Engineering Company Pty Ltd was a subsidiary of Malcolm Moore Industries Ltd whose manufacturing engineering works were located on Williamstown Road, Port Melbourne from 1927. The founder established the main business in 1921 and retired in 1953.21 The business was delisted from the Australian Stock Exchange in 1976. Grace Blake advises that some of the earlier SMRC members were plumbers and therefore worked in trades connected with engineering. She reports that Peter Watson recalls some of his contemporaries completing their engineering apprenticeships at Malcolm Moore Industries Ltd in the 1970s. There are still many unanswered questions concerning the history and provenance of the rowing machine at the time of writing this report, but the connection with a local engineering works is certainly fascinating. Questions to explore in the future include: Did Moore manufacture the machine, or import it (and perhaps assemble it) under licence? Was this machine a ‘one-off’ or did Moore make / distribute others within Australia? When, why and how did SMRC acquire the machine? Why did SMRC decide not to retain it, but to pass it over to APRC? And how did APRC use it?" 2014 Significance Assessment, pp38-40. 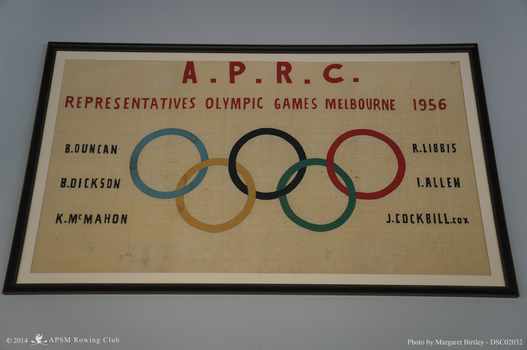 A handmade embroidered banner to commemorate the Albert Park members who were part of the 1956 Olympic Rowing team. "The banner has been with the Club since it was created in 1957. Recent research has confirmed that it was made by Joan Eddy, the wife of club member Kevin Eddy and a professional seamstress. Grace Blake’s interview notes record her conversation with Mr Eddy on 24 October 2014: Kevin confirmed that the banner was made by his wife, Joan Eddy, in time for the opening of the new shed after the Olympics (1957). Kevin was the Social Secretary at the time, and co-opted his wife, who had worked as a machinist for Harford Clothing in Carlton before they married. Her mother had also worked there as a sewing hand (hand sewing the linings for jackets). The company was later taken over by Sires. ... It was made at home (Joan had ‘retired’ from work by then)." Excerpt from the 2014 Significance Assessment, p32. Banner Celebrating Albert Park Rowing Club Olympic Representatives, 1956 Statement of significance by Margaret Birtley, October 2014 Harry Gordon, the distinguished Australian sports historian, wrote of the 1956 Melbourne Olympic Games: "When the Olympic Games moved into Melbourne ... it was as if the city had been brushed by a certain magic. Nothing before or since ... has ever evoked such sheer emotional involvement from the whole community." Gordon refers to the large crowds that massed in Melbourne with anticipation and exhilaration on the day before the official opening, ‘with little apparent motive other than just to be there, and be happy’. 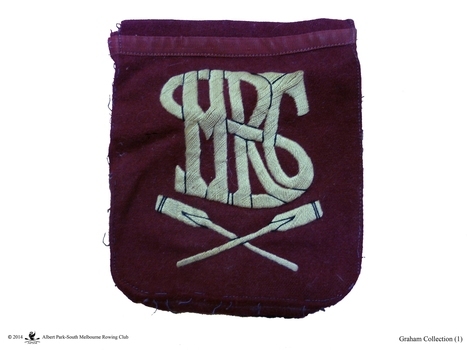 The hand-crafted banner celebrating Albert Park Rowing Club’s representatives at those Olympic Games seems to exude that same sense of joy and exhilaration. Made by the wife of the club’s social secretary, it testifies to the admiration felt by individuals and organisations for the success of their own on a world stage. The banner has historic significance for its accurate documentation of the great achievement of a single rowing club in contributing six outstanding athletes to the relatively small Australian rowing team. Additional historic significance derives from the fact that this is an unofficial expression of tribute and pride. The banner’s incorporation of the Olympic rings would now be likely to require licensing by the Australian Olympic Committee, a process that can dampen social engagement. While definitely a hand-made item, there is some aesthetic significance in the design and execution of the banner. Good judgement has been demonstrated in the selection of fabrics and the choice of colours. The workmanship is quite skilful. The vertical symmetry and the horizontal balance of the design are pleasing to the eye. The use of red for the heading lines and black for the Olympians names is well-chosen and aesthetically pleasing. 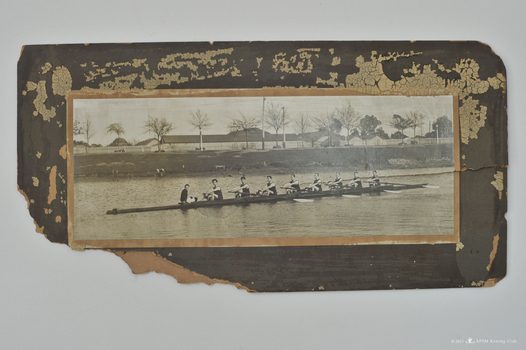 The collection holds black and white photographs of the same oarsmen at the Olympic regatta. This banner complements their role in the collection by providing colour and a sense of connection with an affectionate and supportive community. Its social significance transcends the local context for which it was created and used, to become part of the large body of art, craft and memorabilia that are associated with the Olympic movement worldwide. Unframed photograph of the crew which won the inaugural interstate men’s lightweight coxed four in Penrith, 1958. "As with most items in the AP-SMRC collection, the ‘chain of ownership’ is not formally recorded for this item. The image is not unique, but is one of a set that was produced for each of the men represented in the photographs, with perhaps additional copies for the SMRC. Lance Gallagher, speaking with Ms (Grace) Blake and the consultant (Mrs Margaret Birtley) on 8 June 2014, recalled the photograph well and confirmed on 17 July 2014 that he has a personal copy." 2014 Significance Assessment, p28. 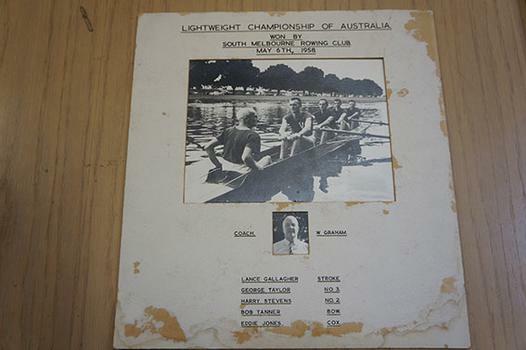 Lightweight Championship of Australia / Won by / South Melbourne Rowing Club / May 6th, 1958 Coach W. Graham / Lance Gallagher Stroke / George Taylor No. 3 / Harry Stevens No. 2 / Bob Tanner Bow / Eddie Jones Cox / South Melbourne state crew ??? This event became the Penrith Cup. 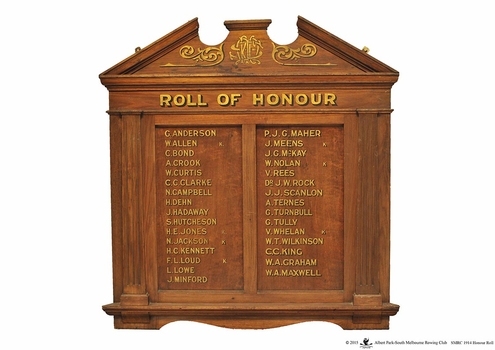 A wooden honour board depicting the names of the World War One enlistments from the South Melbourne Rowing Club. The names are written in gold lettering. 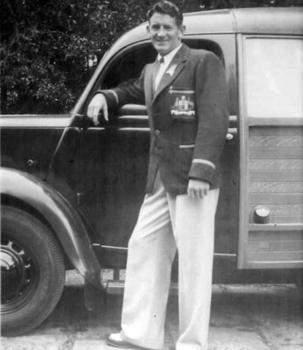 A black and white photograph of Jack Webster in Australian national uniform standing in front of a car. The photograph is under glass with a white cardboard mounting. A black and white studio portrait of the members of "C" Company, No 7 Training Battalion. The photograph is under glass in a wooden frame with a green cardboard mounting. 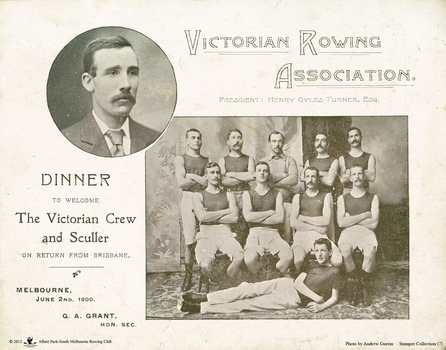 Booklet - Dinner to welcome the Victorian crew and sculler on return from Brisbane. A black and white dinner program to welcome the representatives of the 1900 Inter-Colonial Eight-Oared Race. VICTORIAN ROWING ASSOCIATION / PRESIDENT HENRY GYLES TURNER, ESQ. / DINNER / TO WELCOME / The Victorian Crew and Sculler / ON RETURN FROM BRISBANE / MELBOURNE, / JUNE 2ND, 1900 / G. A. GRANT HON. SEC. A black triangular pennant with navy blue edging and white embroidered letters. The pennant has a rope attached. A red woollen blazer pocket with white embroidered letters. From the Wal Graham Collection. A black and white staged photograph of the winners of the 1915 Champion Eight. The photograph is mounted on cardboard with a separate wood veneer mounting. A black and white staged photograph of the Albert Park Maiden Eight who won at the Colac Regatta. The photograph is in a brown wooden frame with a gilt edge and is on beige cardboard mounting. 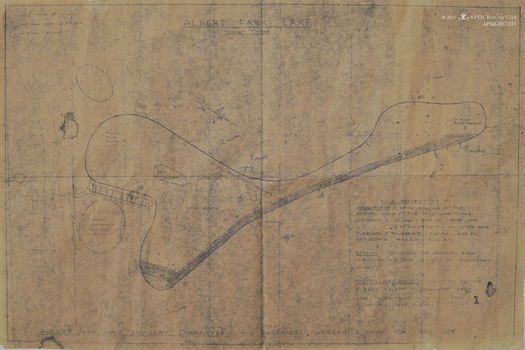 A dyeline-type map of Albert Park Lake and buildings.